With number 5 in my list of favourite musical contributions to the It Gets Better project, the contributions become much more ambitious artistically. It gets more and more satisfying to rewatch each video and remind myself why it is special. My 86-year old mother has visited the It Gets Better project site, and so I hope you have too. Watch some of the over 10,000 videos contributed by people, from all walks of life, with a common theme: encouraging youth who are being bullied, and perhaps contemplating ending their lives, to believe that life gets better after high school — and that they too should stick around to see it happen. Last July, I posted number 7 in my list of top favourite musical contributions to the It Gets Better project. After an interval, I’m continuing with number 6. If you haven’t come across It Gets Better, then run don’t walk to the It Gets Better project site. Watch some of the over 10,000 videos contributed by people, from all walks of life, with a common theme: encouraging youth who are being bullied, and perhaps contemplating ending their lives, to believe that life gets better after high school — and that they too should stick around to see it happen. The project started in late 2010, and no longer has the new-project enthusiam. Still, the passion of the messages and the diversity of the messengers is moving. Number 6 is a guest appearance by country singer LeAnn Rimes with the Gay Men’s Chorus of Los Angeles (GMCLA). I found this video after finding another, even more impressive, It Gets Better video by the GMCLA. That will appear later in the countdown. This is a beautifully sung performance of a wonderful song, and that alone is good. But what really tops it off is the heartfelt, at times tearful, introduction by Rimes — along with the supportive but sassy interjections by the chorus. This performance is an example of the world of professional entertainment, bringing its polish to the It Gets Better series. Bravo to Rimes and to the Gay Men’s Chorus of Los Angeles! Enjoy, and see you again in a few days. No, really. In honour of the Vancouver Pride Parade and Festival today, which celebrates the spice which lesbian, gay, bisexual, and transgender (LGBT) people contribute to our community — by means of a parade that ran literally past our front door — I’m kicking off a blog post series featuring my top seven favourite musical contributions to the It Gets Better project. You know I am against California’s Proposition 8, which eliminates marriage, and I’m a Silicon Valley boy. I was really pleased to see over 50 Silicon Valley leaders take a public stand against Proposition 8, in the form of a full-page ad in the San Jose Mercury News today (October 31, 2008). One name really meant a lot to me: that of Chuck Geschke, co-founder and co-Chairman of Adobe Systems, where I worked for 16 years. With respect to all the other notable people in the ad, Chuck Geschke’s name means the most to me. Like many Adobe-ites in the 1990’s, I learned about ethical, successful business from Chuck and from John Warnock, and from Adobe Systems, the company they founded. I was just a worker bee, but their ethics and culture permeated the place. My spouse and I are proud to have been part of this step to fight the anti-marriage Proposition 8 constitutional amendment in California. This was sent out today (July 22, 2008) to Equality California’s email list. I’ve edited it slightly to fit the blog format. 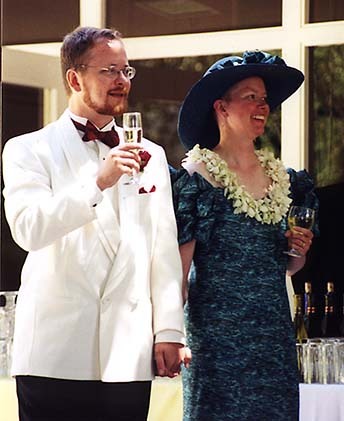 Ten years ago, we decided to take the plunge. Standing at our side were our friends, Rich and Chris. I don’t think we would have gotten married without their good example. Their household was filled with love and laughter, and the just and equitable relationship they built was an inspiration for us.